ALZip, it’s a very cute unzipping program. Though AlZip is not as good as 7Zip or Winrar, its worth trying this software.ALZip represents a new compression file format, the EGG file! EGG file is great for global usage since it supports for Unicode. Compressing into EGG file saves you time to convert the language of the archive you need to encode. 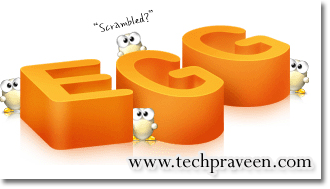 EGG file is a smart archive that selects the best method to compress. The Optimized Compression option analyzes the files and decides whether it should concentrate on compression ratio or compression speed or others. EGG file is also designed for very large archives. There is no data loss when compressing in EGG file. ZIP, 7Z, RAR, EGG, TAR, TBZ, LZH, Z, JAR, ALZ, ACE, ARC, ARJ, B64, BH, BHX, BIN, BZ, BZ2, CAB, EAR, ENC, GZ, HA, HQX, ICE, IMG, LHA, MIM, NRG, PAK, TBZ2, TGZ, UUE, UU, WAR, XXE, ISO, LCD, ZOO, for uncompressed and compresses to ZIP, EGG, ALZ, TAR, TBZ, TGZ, LZH, JAR. Yes, you read it right, it compresses to EGG. That would be the new 8.0 alpha that just got released that supports that format, and it’s basically an ultra compressed ZIP file. It’s interface is also darned easy to understand, to say the least, it’s impossible to get lost in the interface. Now, what’s really nice is that they’re giving a free license away for everyone to celebrate the release of 8.0a. When 8.0 Final releases, they will send out an email with your free license. All you need is an email address. This is a $29.99 value that we’re getting free for the short term, so don’t get greedy now. ALZip works on Windows 2000, XP, Vista, and windows 7, 32 bit and 64 bit versions interchangeable. 2. Enter a valid email Id. 3. 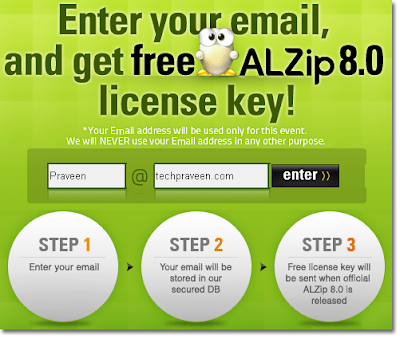 You will recieve a free ALZip 8.0 Licence key.